These high-quality metal coins replace the cardboard coins contained in 7 Wonders: Duel. Both versions (the official one from Repos Production and the one from the Broken Token) contain as many of each coin as there are cardboard coins in the core game: 14 with value 1, 10 with value 3 and 7 with value 6. The coins from both version are different. 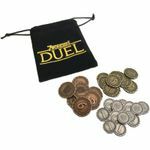 The official version from Repos Production also comes with a 7 Wonders: Duel bag to store the coins in. The coins from Broken Token differ from the official ones from Repos Production: They have different backs particularly for the coin values 1 and 6. Coin value 6 shows a palm instead of the feather which the official coins (both cardboard and metal) feature.